Since being jailed in Britain shortly after returning from an illegal trip to the United States to speak to a gathering of anti-Muslim bigots last September, the ranks of Stephen Yaxley-Lennon’s far-right English Defence League have reportedly been dwindling. 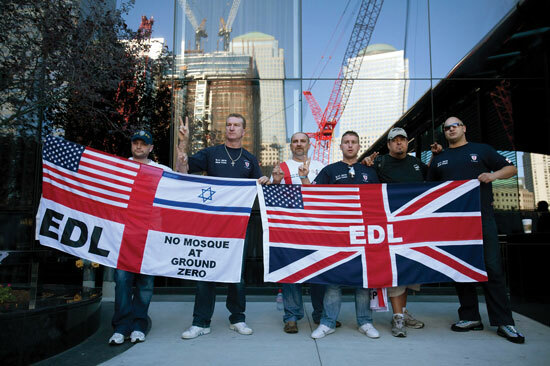 Attendance at the group’s anti-Muslim rallies and marches is down and its members have been drifting away as the EDL “splinters into more extreme factions,” according to Channel 4 News in England. Yaxley-Lennon pleaded guilty on Jan. 7 to using a friend’s passport to illegally enter the United States to attend and address a conference in New York City of an international right-wing umbrella group, Stop Islamization of Nations (SION). The conference included a U.S. SION spinoff, Stop the Islamization of America (SIOA). Pam Geller, the American anti-Muslim movement’s most visible and flamboyant figurehead and a Yaxley-Lennon ally, heads SIOA. Since Yaxley-Lennon’s arrest, Geller has tried to turn him into a martyr. After pleading guilty, the EDL leader was sentenced to 10 months in prison. But before sending him off to prison, there was a little confusion about which name to use in sentencing him: Stephen Yaxley-Lennon, Tommy Robinson or even a third name. When he returned to England, Yaxley-Lennon used his legal passport, which apparently bears his real name — Paul Harris.